Place chicken, olive oil, lime, garlic and chilli together in a bowl. Season and leave to marinate for 20 minutes. Heat a griddle pan/barbecue. Cook chicken till golden, cooked through. Combine avocado, papaya and coriander with a squeeze of lime. Season. Heat pitas to packet instructions. 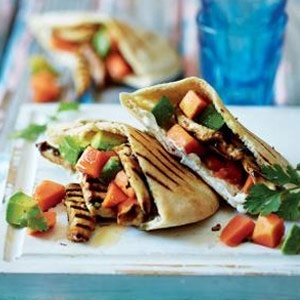 Slice in half and fill with a little mayonnaise, chicken and avo mixture. Top with extra fresh coriander. Serve immediately, with extra mayonnaise.